Map showing 2018 operating areas for NOAA Ship Okeanos Explorer. Image courtesy of the NOAA Office of Ocean Exploration and Research. Download larger version (jpg, 836 KB). From October 2017 to September 2018, NOAA Ship Okeanos Explorer will return to the Atlantic Ocean and conduct a series of expeditions to continue exploration of the deep waters of the U.S. Gulf of Mexico and North Atlantic. A multidisciplinary team of scientists, technicians, and engineers – both on board the ship and on shore – will conduct undersea mapping and remotely operated vehicle (ROV) explorations of the geological, biological, archaeological, and chemical features of these vast areas. The team will investigate the Gulf of Mexico, Mid- and South Atlantic Bight, Northeast U.S./Canada transboundary area, and a priority mapping area in international waters south of Bermuda. The Atlantic expeditions are all part of the Atlantic Seafloor Partnership for Integrated Research and Exploration (ASPIRE) campaign - an umbrella for a subset of deepwater field activities that support the Galway Statement on Atlantic Ocean Cooperation . NOAA is proud to be partnering with Canada and the European Union to conduct work in support of the Galway Statement. The Galway Statement is an initiative between the U.S., Canada, and the European Union to advance knowledge of the Atlantic Ocean leading to improved stewardship and understanding. Operations in all areas will be designed to complement previous and planned work. Expeditions will also include two technology demonstrations to test novel approaches or emerging technologies for ocean science, strengthening the use of the Okeanos Explorer as a platform for technology advancement and testing. NOAA is seeking scientists and managers interested in actively participating during some or all of the 2018 expeditions. For details on opportunities to get involved, please visit this page. If you are interested in providing input into expedition planning or participating as a scientist or student, please contact the Expeditions Science Advisor, Dr. Scott France at france@louisiana.edu. Download the NOAA Ship Okeanos Explorer: 2018 Overview (pdf, 3.0 MB). Map showing the approximate planned transit path for the Okeanos Explorer from Honolulu, Hawaii, to Panama City, Panama (yellow line). Image courtesy of the NOAA Office of Ocean Exploration and Research. Download image (jpg, 33 KB). In late 2017, the Okeanos Explorer will transit from the Pacific Ocean to the Gulf of Mexico and ultimately the Atlantic Ocean – while mapping as much as possible along the way. From mid-October to November, the ship will transit about 5,000 nautical miles from Hawaii to Panama while mapping key unexplored areas along the Clarion Fracture Zone. 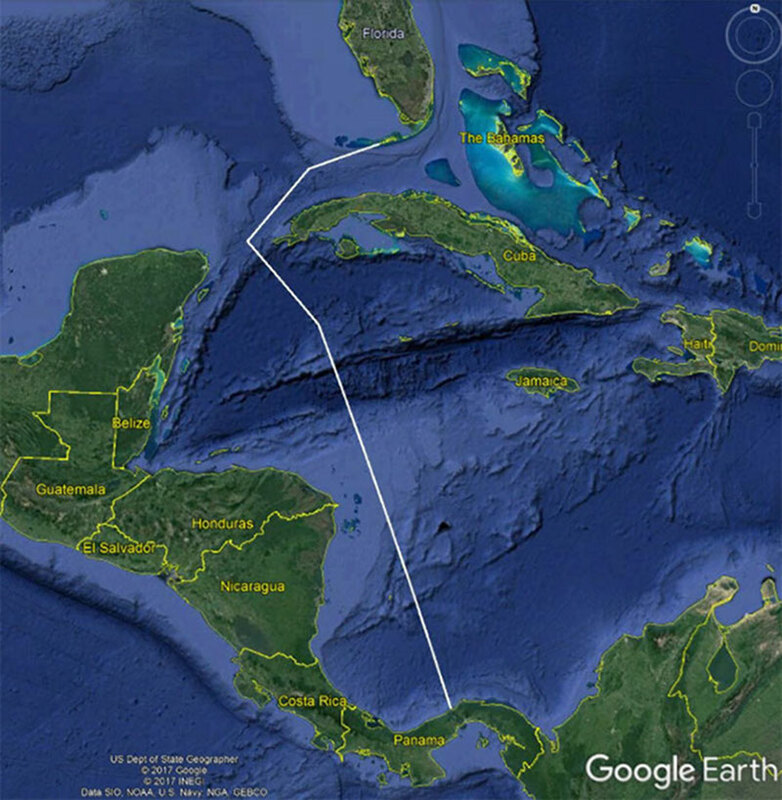 Map showing the approximate planned transit path for the Okeanos Explorer from Panama to Florida (white line). Image courtesy of the NOAA Office of Ocean Exploration and Research. Download image (jpg, 144 KB). The Clarion-Clipperton Fracture Zone is a major geological feature of interest in the eastern Pacific and is a global hotspot of polymetallic nodule formations of potential interest to many nations. Mapping this region will provide insights into plate tectonics along a major oceanic fracture zone and baseline information to support further exploration and habitat characterization. 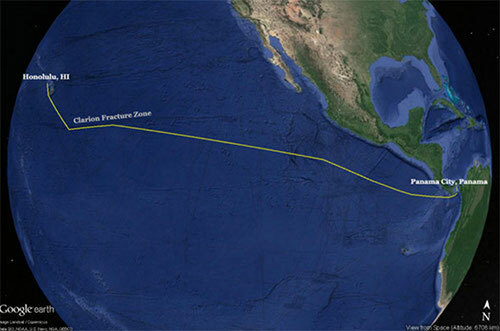 The cruise track will transit through the center of the large oxygen minimum zone (OMZ) found in the eastern Pacific. A new nitrogen sensor technology will be tested as part of CTD casts conducted outside and inside the OMZ. Once the ship reaches Panama, it will transit through the Panama Canal into the Caribbean Sea and conduct an eight-day cruise to Key West, Florida. This cruise will include exploratory transit mapping through the Caribbean and Gulf of Mexico. October 16 - November 11, 2017: Telepresence mapping and CTD rosette casts starting in Honolulu, Hawaii, and ending in Panama City, Panama. November 15 - 22, 2017: Mapping starting in Panama City, Panama, and ending in Key West, Florida. An aggregation of methane ice worms inhabiting a white methane hydrate in the Gulf of Mexico. Studies suggest that these worms eat chemoautotrophic bacteria that are living off of chemicals in the hydrate. Image courtesy of the NOAA Office of Ocean Exploration and Research. Download larger version (jpg, 72 KB). From November 2017 to May 2018, the Okeanos Explorer will return to the Gulf of Mexico for three expeditions. This work will be in partnership with NOAA’s Deep Sea Coral Research and Technology Program and the Office of National Marine Sanctuaries. The expeditions will consist of more than 60 days at sea combined with both ROV and mapping operations as well as dedicated time for testing and demonstrating emerging technologies from the Okeanos Explorer. Work conducted in the Gulf of Mexico will also support the Southeast Deep Coral Initiative – an interagency initiative to coordinate the research efforts of several NOAA line offices as well as other federal partners such as the U.S. Geological Survey and Bureau of Ocean Energy Management. At-sea operations will focus on unmapped areas, deep-sea coral and chemosynthetic communities, and submerged cultural heritage sites. November 29 - December 21, 2017: ROV and mapping starting in Key West, Florida, and ending in Pascagoula, Mississippi. March 17 - 19, 2018: Sea trials and ship shakedown starting in Pascagoula, Mississippi, and ending in Galveston, Texas. March 23 - April 5, 2018: Mapping and emerging technology testing/demonstration starting in Galveston, Texas, and ending in Pascagoula, Mississippi. April 11 - May 3, 2018: ROV and mapping starting in Pascagoula, Mississippi and ending in Key West, Florida. The southeast coast of the U.S. is home to a diversity of habitats that include deep-sea coral and sponge communities and chemosynthetic communities around methane seeps. From May to June 2018, NOAA will explore the extent of these habitats and seek to identify new ones. Image courtesy of the NOAA Office of Ocean Exploration and Research. Download image (jpg, 127 KB). From May to June 2018, the Okeanos Explorer will operate offshore of the U.S. South-Atlantic and Mid-Atlantic coast for a combined 32 days at sea. 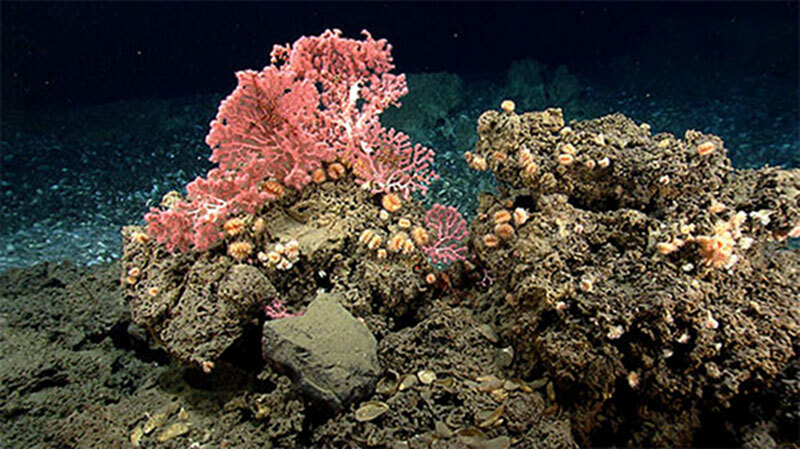 This region has extensive yet poorly explored deep-sea coral habitats that are of high interest to federal and state agencies with research and management responsibilities. At-sea operations will include collecting bathymetric data of the Blake Plateau region and exploring and characterizing deep-sea coral and sponge habitats, gas seeps, chemosynthetic communities, and continental slope canyons. At-sea teams will also deploy optical sensors for validation of Visible Infrared Imaging Radiometer Suite (VIIRS) satellite data with opportunistic mapping and CTD operations. 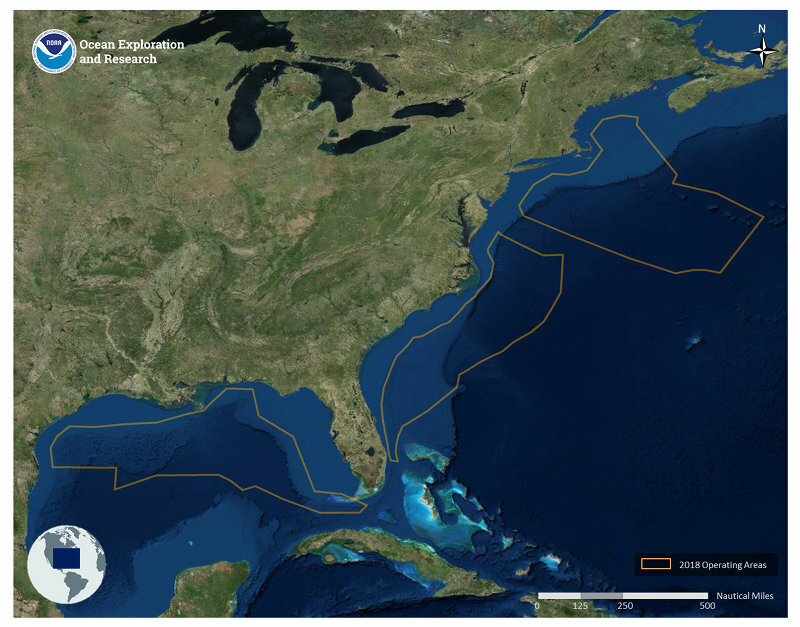 Explorations in this region will improve deep-sea coral habitat suitability models and geohazards models, as well as international efforts to better understand nearshore-offshore connectivity and biogeographic patterns across the Atlantic. The Mid- and South Atlantic Bight expeditions will be closely coordinated with partners, resource managers, and will collaborate with ongoing interagency and NOAA efforts in the regions. As part of ASPIRE, NOAA and partners will leverage the significant contributions from the Atlantic Canyons Undersea Mapping Expeditions (ACUMEN) campaign, a series of expeditions aboard NOAA Ships Henry B. Bigelow, Ferdinand R. Hassler, and Okeanos Explorer from 2011 - 2014, and use this opportunity to fill data gaps and to conduct ROV dives on a number of targets identified during the ACUMEN campaign. May 9 - 18, 2018: VIIRS sensor validation, mapping, and CTD rosette casts starting in Key West, Florida, and ending in Mayport, Florida. May 22 - June 6, 2018: Mapping starting in Mayport, Florida, and ending in Charleston, South Carolina. June 11 - July 2, 2018: ROV and mapping starting in Charleston, South Carolina, and ending in Norfolk, Virginia. A variety of deep-sea corals found on a ledge in an unnamed “minor” canyon between Heezen and Nygren Canyons, including the stony coral Lophelia pertusa, a large white gorgonian Paragorgia (bubblegum coral) and a small red Paragorgia (upper left), and the gorgonian Primnoa (orange, center). Image courtesy of Northern Neighbors: Transboundary Exploration of Deepwater Communities. Download image (jpg, 82 KB). Exploration efforts in support of ASPIRE and the Galway Statement will continue from July to September 2018, extending east to international waters south of Bermuda and north to deep waters off the coast of New England and Atlantic Canada. Starting in July, a 24-day cruise from Norfolk, Virginia, to Hamilton, Bermuda, will map an area southeast of Bermuda identified as a priority area by the Atlantic Seabed Mapping International Working Group (ASMIWG) at the 4th Annual Galway Trilateral Meeting in April 2017. As part of the Galway initiative, the ASMIWG used a suitability model to identify priority areas in the Atlantic Ocean, factoring in areas of public interest, sensitive marine areas, and areas with marine resource potential. This will be the first U.S.-led mapping effort in support of the ASMIWG. In August 2018, the Okeanos Explorer will head northeast to explore deep waters off the coast of New England and into Canadian waters. Exploration targets are expected to include undersea canyons including minor canyons and inter-canyon areas, slope areas, seamounts, deep-sea coral and sponge habitats, chemosynthetic communities, and unmapped or poorly mapped areas. 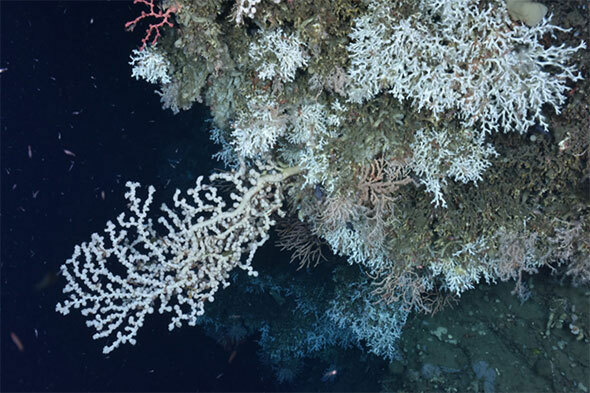 Data acquired are expected to ground truth and inform deep-sea coral and sponge habitat suitability models and support both the science and management communities. The 2018 expeditions will conclude with mapping operations and testing and demonstrating emerging technologies from the Okeanos Explorer offshore of New England. These operations will be planned to complement previous work in the region, including building on the 2014 and 2017 transboundary collaboration cruises between NOAA and the Department of Fisheries and Oceans Canada and the 2011-2014 ACUMEN campaign. July 12 - August 4, 2018: Mapping starting in Norfolk, Virginia, and ending in Hamilton, Bermuda. August 11 - September 2, 2018: ROV and mapping starting in Hamilton, Bermuda, and ending in Davisville, Rhode Island. September 8 - 19, 2018: Mapping and emerging technology demonstration starting and ending in Davisville, Rhode Island.